GlobeNet (news) [a subsidiary of Oi (news)] said yesterday that it plans to build a new submarine cable in the Caribbean. 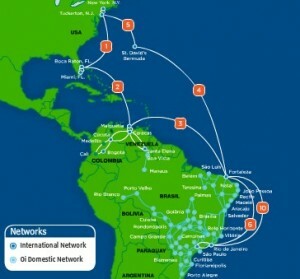 Extending from their their current cable routes hooking up Brazil to the eastern coast of the US and the islands in between, they plan to build a brand new express route between Miami and Colombia. They have an anchor customer for the project already in place. UNE EPM Telecomunicaciones, a major ISP and telecom in Colombia has already signed a long-term agreement for capacity. The Colombian bandwidth market has been making up for lost time over the past few years under an improved political environment. While Brazil still gets the lions share of attention, Colombia is now starting to get its fair share. Globenet's new build is scheduled for completion in 2013. Details on its route and technical specifications were not yet available, but the new system will be able to take advantage of the latest in 100G-capable technology.